The objective of the International Research Training Group (IRTG) “Soft Matter Science: Concepts for the Design of Functional Materials” between the universities of Freiburg and Strasbourg (with colleagues from Basel and Mulhouse participating) is to promote graduate education and scientific exchange in this modern field of research on soft matter materials. Soft matter science is without any doubt a growing and interdisciplinary field of research, attracting equal attention from chemists, physicists, biologists and engineers. In part, this appeal comes from the astounding properties of “soft materials”, e.g., from their unique capacity to respond to external stimuli. Even weak stimuli may induce significant changes in behavior due to the “softness” and mesoscopic structuring of the material. While the softness results from weak interactions — comparable in strength to the thermal energy — between the constituents, mesoscopic structuring is often a consequence of self-assembly, i.e., of the spontaneous organization of matter into ordered arrangements much larger in size than the constituent molecules. Modern materials science increasingly exploits these distinctive features for the design of new materials. Many of today's interesting systems have multiple components, various interfaces, and complex effective interactions. Understanding the synergy of these factors and their impact on materials properties presents a great scientific challenge. Advances in this respect hold the promise of creating novel materials with a level of functionality similar to that existing in nature. 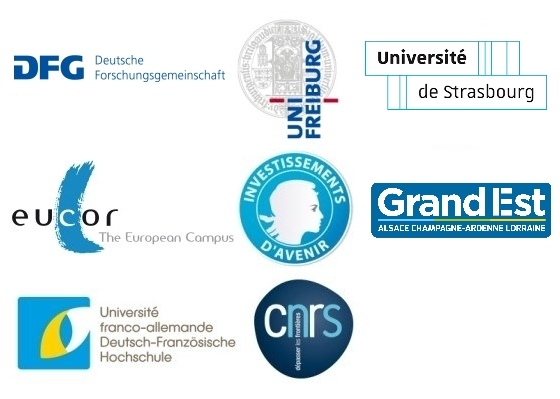 On the French side the Université de Strasbourg (UdS), the Région Alsace, the IdEx and the CNRS provide the financial support for the IRTG, the German partners of the IRTG are funded by the DFG and hosted by the Albert-Ludwigs-Universität Freiburg. The IRTG is also affiliated to the Université franco-allemande/Deutsch-Französische Hochschule (UFA/DFH), which subsidizes associated PhD-students and sponsors the SoMaS summer school. That way broadening the foundation and extending the potential of the IRTG, the IRTG is able to grant even more PhD-students and researchers participating in its mentoring concept and training programme. Furthermore, the IRTG is integrated in the EUCOR and European Campus framework, which interconnects the Upper Rhine universities.